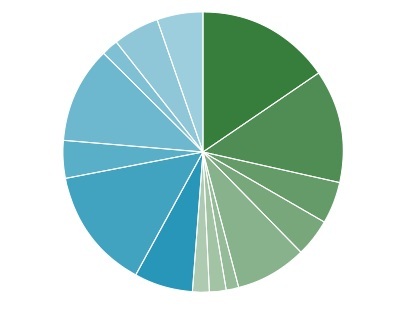 Results of April Poll: What makes you decide to read a book? Hopefully, repeat visitors to my site have noticed I have a monthly poll listed on the side. I try to change it around the first of the month, but I’m usually a few days late. Sometimes I’ll run a poll just for fun or curiosity, such as the poll that asked for your favorite Denise Grover Swank book. Honestly, some of the answers on that one surprised me. But often, I’m asking to help me understand how MY READERS react/respond/behave in regards to books. I’m either trying to determine the best way to market to other readers OR I’m trying to determine what my readers are looking for/wanting from an author or a book. April’s poll was the later. I wanted to know how readers pick books to read, hoping to glean information to reach out to new readers. I created the poll so that multiple answers were allowed because I myself am not limited to only one way. I take friend recommendations and look at reviews. I collected this information for just myself, but it occurred to me that others might interested in the results too. I used PollDaddy (a free service) and they provide a report of the results. Below is the helpful information. There were 207 responses. I don’t have data telling me how many responders provided answers. All research I had found before this poll indicated that friend recommendation was the best source of garnering a book sale. This poll has the same results, but barely. A Goodreads poll had placed this influence around 35% but my own poll puts that descion factor at a little over 15%. I found that surprising, but keep in mind, my sample pool is relatively small and probably limited to my readers since I rarely announce the new polls. Also, readers were allowed to pick MULTIPLE answers which might have diluted the results. But this just proves what we already knew and what I preach at any self-publishing program I give. The very first step to publishing a book in any venue is to write a damn good book. You need a book your readers are going to talk about days after they finish. A book they think is so good they convince their friends to read it. The second biggest influencer was reviews on SALES SITES such as Amazon and Barnes & Noble, coming in at 14%. This doesn’t surprise me. My own personal experience, both as an author and a reader, is that reviews are extremely important. When I release a new book, I try to make sure I have at least ten reviews within a week of the book’s release. A good book review is the next best thing to a friend recommendation. In essence, it’s a recommendation from a stranger, but a recommendation all the same. Chosen has more low reviews on Amazon than I would like. Out of 97 reviews, 11 are two or one stars. That bothers me. Until I realize that I’ve received eleven low reviews out of over 36,000 PAID copies of Chosen and over 50,000 FREE downloads of Chosen. When I look at it that way, it’s more palpable. It’s important to reiterate that reviewers are meant for READERS not for the author. The third biggest influencer is something I’ve believed to be true, but now have some factual proof to back up. 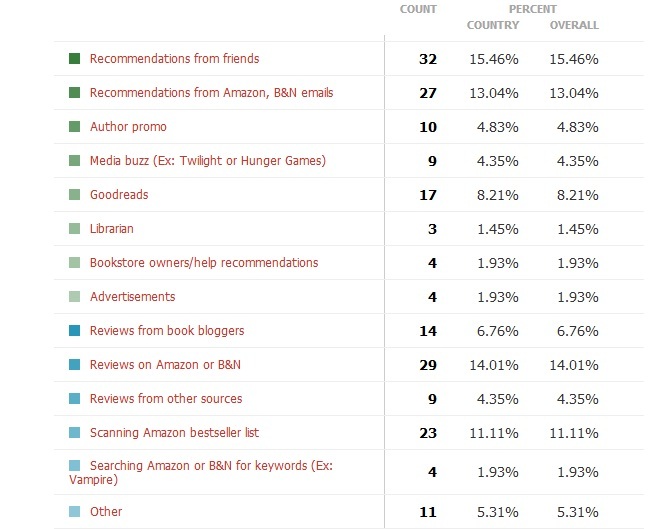 13% of readers are influenced by the emails and recommendations from Amazon and Barnes & Noble. While I didn’t specifically ask this, and in hindsight I should have, I suspect this includes Amazon’s “Also Bought” carousel. The Also Boughts are obvious, they are books readers bought in addition to the book on the product page. The real beauty here is Amazon and Barnes & Noble recommendations through emails. I’m not sure how Barnes & Noble picks the books they recommend, but Amazon picks their’s from the top 100 of genre. While the nature of long tail marketing is one of the greatest attributes of self-publishing, these results support something I’ve believed since last fall: you need to get your book on the top 100 of its genre and keep it there as long as possible. As long as it’s there, Amazon is giving you free advertisement. Hello! How awesome is that??? The fourth, coming in at 11%, is scanning the Amazon bestseller list. I saw proof-positive of this last Christmas. My fourteen year old daughter got a Kindle Fire as a gift and after she played around with apps, she decided it was time to use her gift card and buy books. How did she decide what to buy? She went to the Best Seller list for YA. ** I intend to discuss my daughter’s experience and reading habits since acquiring her Kindle in another blog post. ** This is another fact supporting the need to find ways to get your book as high as possible and keep it there. Books that dip in the Top 100 in Kindle sales list, from 60-100, tend to fall out faster. I’ve learned this through personal experience with Chosen and Twenty-Eight and a Half Wishes on the Top 100 of the Kindle store. Chosen climbed onto the list in December and only lasted a few days, climbing into the 80’s. Twenty-Eight and a Half Wishes did the same after its free promo in April. But when Chosen shot to the top of the Top 100, getting as high as #19, it lasted on the list for a week and a half. Fifth was Goodreads at 8%. This was actually lower than I expected, but I need to take two things into account. One, I suspect a good portion of my readers aren’t on Goodreads. When I sent out ARCs of Sacrifice to self-declared, devoted readers of The Chosen series, I requested that they review the book on Goodreads and Amazon. I found that at least half of the twenty readers weren’t on Goodreads. But I wonder if the second reason has some importance as well: Goodreads has become a bit of a battleground between reviewers and authors. The ugliness is turning readers away. Personally, I spend much less time on Goodreads than I used to. While I expect to read bad reviews of books, I cringe when I read scathing, ugly, and insulting attacks. (And I’m not talking about my own books.) Sure, I don’t have to read them. But it’s hard to ignore them when they show up on your front page. Reviews from book bloggers came in sixth at 6%. This was also surprising given the success I’ve garnered from participating in tours. However, one hypothosis might be that the books garnered early readers with book blogger reviews, then spread out to readers who don’t typically read blog reviews. Blog tours review and typically post on Amazon and Goodreads, adding to #2. I have had fantastic success with my books tours for Twenty-Eight and a Half Wishes and Chosen, but I’ve had three separate book tours for Here, with lots of positive reviews, and hardly any increase in sales. I believe this is because Here is YA, but I also think my last blog tour– a week long blitz of over thirty bloggers–was harmed by the large number of blogs that offered Here in a giveaway, taking away impulse sales. But that is a topic for another day. At 5% is the elusive other, the seventh influencer. Respondants could fill in the blank and the answers were varied. Out of eleven write in reasons, four were for book decription or blurb, and two were for book cover. The rest of the answers referred to preferred genre or autobuying an author. So what does all this data mean? For me, it tells me that I’m focusing on the right areas. How do you get people to recommend your book to friends? Write a book they can’t put down and can’t forget. How do you get reviews? After you complete the answer to the first question, then you entice readers to leave reviews. Offer ARCs in exchange for an HONEST review. Have contests so reviewers can win a prize, such as an Amazon gift card. If you are an author, did this blog post help you? Were any of these answers a surprise to you as an author or a reader? This is very interesting. It looks like friends recommendation, reviews on Amazon & B&N, their recommendations, and book bloggers won out. Great to know. Thank you for doing this!